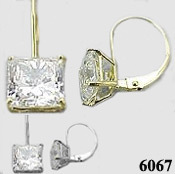 Stock #6067:2 Carat TW Princess Cut Cubic Zirconia Earrings, Solid 14K Gold Euro-Back wires... Unbelievable Price!!! Very Nice Stones!!! Top Quality, Russian CZs are more precisely cut & polished from the finest CZs available (Look better than most diamonds! ).Also available in 14k White Gold.